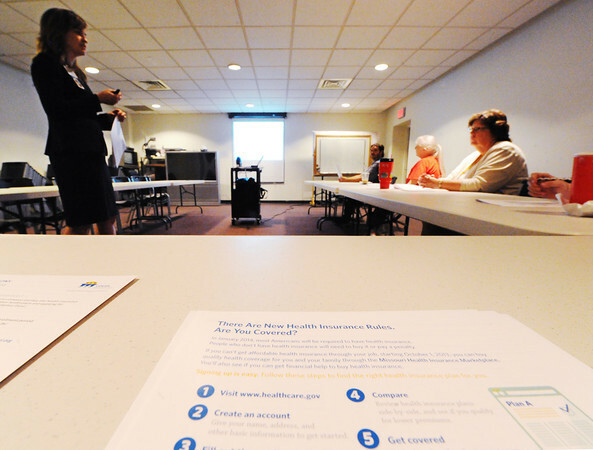 Amanda Mitchell (left), Freeman Health System marketplace grant coordinator, teaches via a projected PowerPoint slide show Tuesday afternoon, Sept. 24, 2013, during a new health insurance rules training session at the Joplin Public Library. Freeman Health System acquired a grant to reach out to organizations (such as the library) and businesses to educate the public on the new system. Paperwork on the new system lays in the foreground.